Read more about this story from CNN affiliate KNXV. (CNN) -- Hollywood couldn't have better scripted the wall of dust that looked big enough to eat Phoenix. The violent dust or sandstorm, called a haboob, typically occurs over desert land and can stretch thousands of feet high, according to the National Weather Service. Tuesday evening's version, which had sustained winds of up to 69 mph and stretched more than 100 miles at one time, was especially intense. Oddly, the thunderstorm it accompanied produced little rain. "I've never seen it like this before," said National Weather Service meteorologist Craig Ellis, who has 33 years of service. The dust storm caused low visibility and delayed flights in and out of the state's largest airport. At least three flights were canceled and about a dozen were delayed at Phoenix's Sky Harbor Airport, said airport spokeswoman Julie Rodriguez. A few planes were checked for any dust in their engines. The airport was operating normally Wednesday, according to Rodriguez. It suffered no real damage, although the dust set off smoke alarms when it entered terminal buildings. CNN affiliate KNXV-TV broadcast striking images of the storm's advance into the Phoenix area. 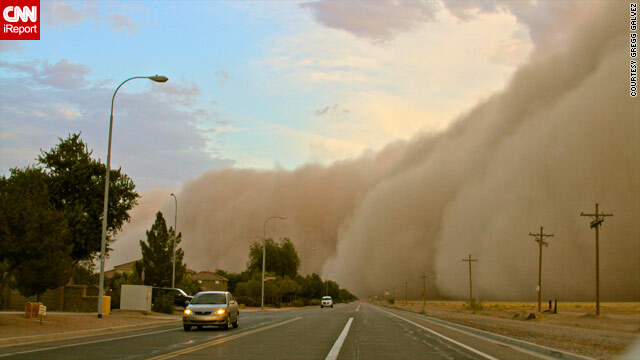 CNN iReporter Steve Siwek Jr. also documented the haboob. "As someone who has been born and raised in Phoenix, I am very used to dust storms," Siwek said. "This one however was unreal. It felt like a movie with its massive size and deep coloration." Ellis said the density of the dust was notable. He likened its appearance to "dirty snow." "Somebody was in line at a car wash and never saw so many cars," he told CNN Wednesday afternoon. More than 10,000 customers were without power at the height of the storm, said spokeswoman Jenna Shaver of the Arizona Public Service. 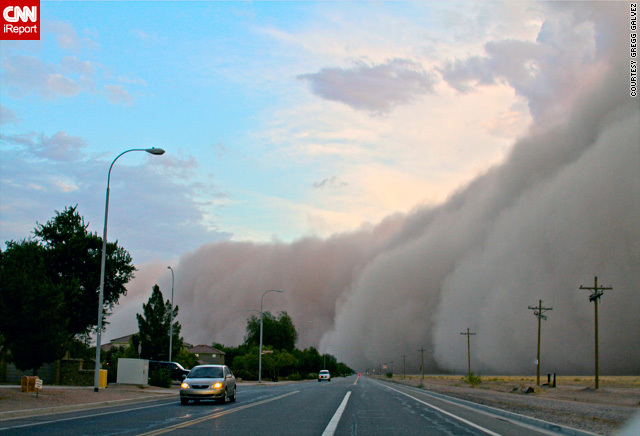 Haboob comes from the Arabic word for wind and is used to describe sand and dust storms across the world. They usually occur during the summer monsoon season in the Southwest. In addition to visibility that can cause accidents, haboobs can also uproot trees, damage roofs and bring down power lines. Some of that occurred in several Arizona cities, including Paradise and Chandler. Trees and other items were uprooted and dust covered building tops and parking lots. There was a possibility of another, but diminished, dust storm Wednesday night, according to Ellis. There was only a slight chance of a thunderstorm. IReporter Christian Medrano, 18, of Tempe submitted a flip video of the incident. "For the brief time the doors were open, a very fine film of dust developed around the house," the college student said. "Physically, we weren't too affected other than dust in the eyes." CNN's Scott Thompson, Phil Gast and Marlena Baldacci contributed to this report.